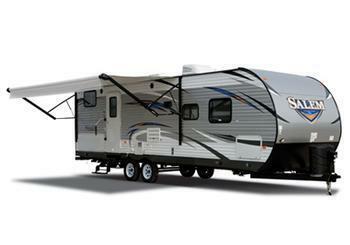 Forest River is recalling 935 model year 2019 Coachmen Catalina & Apex travel trailers, and Forest River Shasta, Wildwood, Salem, Vibe, Sierra, Sandpiper, XLR & Prime Time travel trailers. The missing bearing race may cause premature hub bearing failure, possibly resulting in a separation of the hub from the axle, increasing the risk of a crash. Forest River will notify owners, and dealers will replace the defective hubs with new hubs or replace the axles, free of charge. For customer service, Catalina owners may contact Coachmen at 1-574-825-8657, Apex owners should call 1-574-358-0401, Shasta owners: 1-574-825-8717, Wildwood and Salem owners: 1-574-534-3167, Vibe owners: 1-574-296-2084, Sierra and Sandpiper owners: 1-574-534-4574, XLR owners: 1-574-642-0432, Prime Time owners: 1-574-862-1025. Forest River's number for this recall is 51-0851.